New York Governor Andrew M. Cuomo has signed legislation to support the state’s industrial hemp industry and announced grant funding to advance related research and economic development. 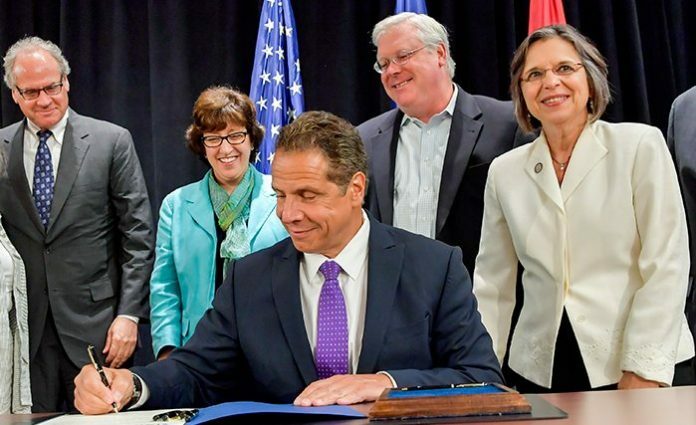 “Industrial hemp is a promising commodity that, with the necessary support and resources, can provide a tremendous boost to our communities by increasing the profitability of our farms, creating new jobs in Upstate New York, and laying the groundwork for future growth,” said Governor Cuomo during the signing event. The legislation signed into law was for a bill the governor introduced last month that treats industrial hemp more like other agricultural crops and removes barriers to industry growth. Also announced was up to $10 million in grant funding, including a $5 million commitment to support research into the production of industrial hemp in New York. This program will support the planting of nearly 2,000 acres for research and boost New York’s industrial hemp production nearly 6,000 percent. An addition $5 million will go to various projects; including the expansion of Cornell University’s seed breeding program, agronomic, market and manufacturing research, capital grants of up to $250,000 for processors and establishment of the Industrial Hemp Working Group and “One-Stop Shop”. The One-Stop Shop will assist help producers and processors in grappling with industrial hemp industry regulations and requirements under state and federal law. The working group will make recommendations with regard to research, highlight opportunities to promote industrial hemp, and advise on policy and program adjustments. Also launched yesterday was a page on the NY government’s website for the industrial hemp sector that provides a summary of the state’s various efforts and support for the industry. “By expanding industrial hemp research and development for both farms and businesses, New York is embracing our legacy of innovation to lead the way on this economic engine that will create jobs from the field to the factory,” said Governor Cuomo. Early this year, the governor indicated his strong support for the emerging sector during his 2017 State of the State speech, committing to positioning New York at the forefront of industrial hemp cultivation and processing.